Glacier National Park, located in Montana in the United States, is so unique and beautiful that it is hard to show all of its features in just a few blog posts. I am already up to part four of our trip to this park and I know I could write dozens more to show all we saw. 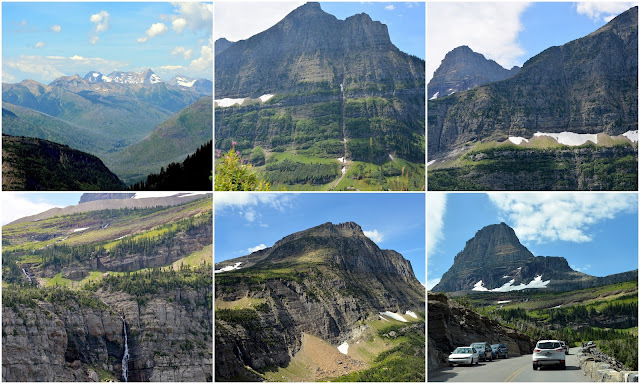 So to condense our visit a bit I want to show you some of the highlights we saw along the 50 miles long Going-to-the-Sun Road, that allows visitors to travel in both directions from west to east, and east to west, through a major portion of the park. On the west side, a large portion of the road is surrounded by towering pines and cedars forests, with large mountain peaks looming ahead. I showed the western entrance, Lake McDonald and the Trail of the Cedars we walked on my Part Two post--click here--so I will not repeat that part of the drive here. We parked in a viewing area and as I was taking photos a large female moose walked out from the trees! 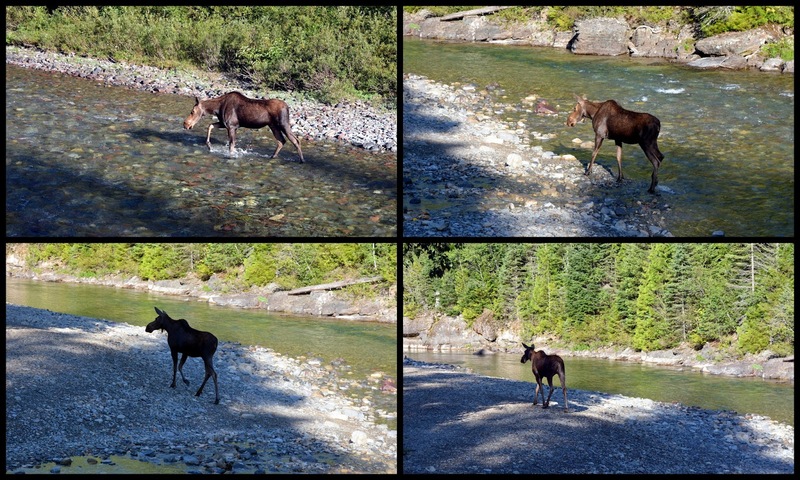 She waded through the creek onto the shore directly below where I was standing, and then wandered off very peacefully. Back in our car and continuing on east after that exciting encounter. To be greeted by the majestic sight of Heavens Peak. If you click on the photo collage above you can read more about the peak. 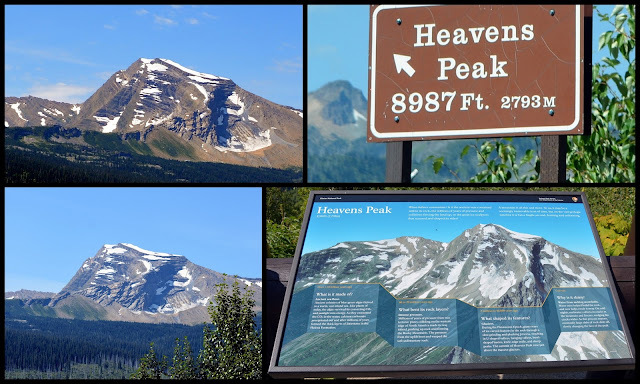 We stopped again in a viewing area to take photos of Heavens Peak. The viewing area was surrounded by the most delightful wildflowers! In fact, wildflowers were in profusion all over the park! 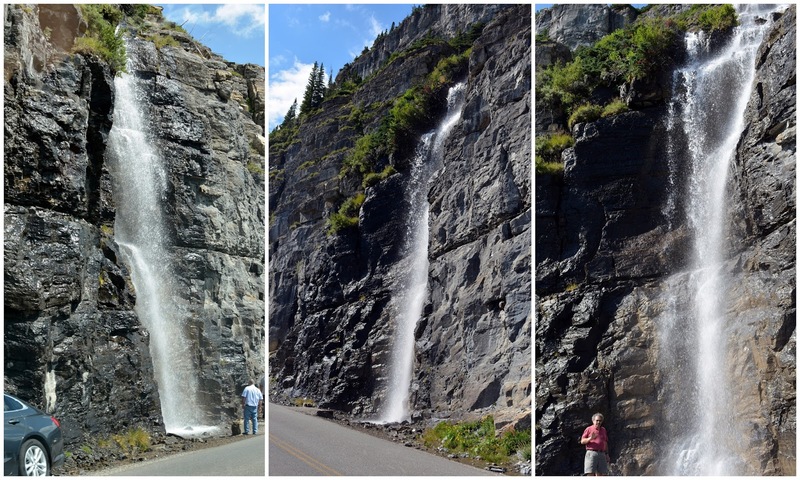 As we drove along the Going-to-the-Sun Road we saw many waterfalls descending from the glaciers in the mountains above. ...and over some of the waterfalls. More photos, above and below, of the peaceful Hanging Valley--McDonald Creek, where I earlier saw the moose, and Heavens Peak, are seen in this photo. Please click on this photo to enlarge it to read more about this area. Looking back at Going-to-the-Sun Road, as it winds around the mountain. Construction on the Going-to-the-Sun Road was begun in 1921 and was formally dedicated on July 15, 1933. Without stopping, it takes two hours to travel the 50-mile road. Another view of Bird Woman Falls and Hanging Valley from another point along the road. We now were approaching another marvel to see within the park--the Weeping Wall. We were visiting in late August so the waterfall that seeps out through the Garden Wall, from snowmelt above, was now mostly a trickle, but enough to create a glistening rock wall and wet road. 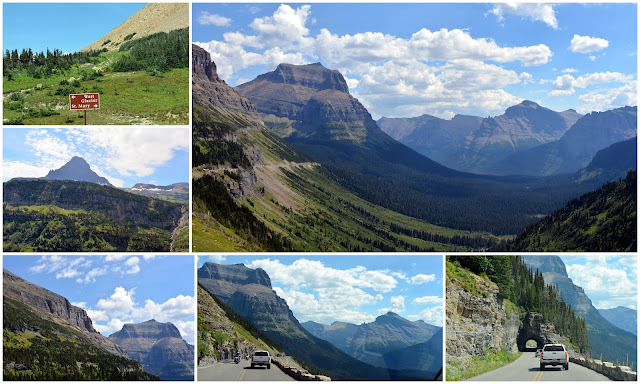 More views of how the Going-to-the-Sun Road twists and turns around the mountains. The views from all points are spectacular! The Triple Arches is a rock bridge support built on the side of a mountain that was a solution to an early engineering problem. While we were visiting the park there was construction repair going on to replace part of the rock railing that had been dislodged by an avalanche during the prior winter season. ....of some of the glaciers across from the Triple Arches. 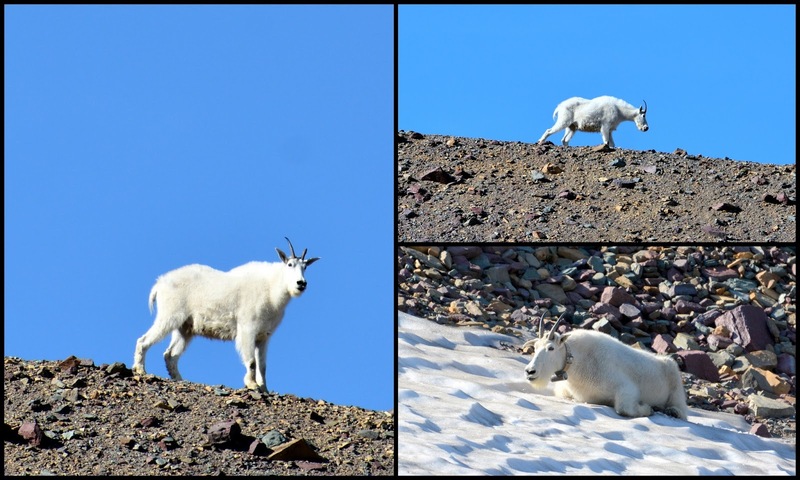 ...we saw a couple of mountain goats frolicking on the rocks. We now reached Logan's Pass. At 6,648 feet, it is the highest point on the Going-to-the-Sun Road. Logan's Pass is 32 miles (51,5 km) from the west entrance and 18 miles (29 km) from the east entrance to Glacier National Park. It is a popular place to visit and the parking lot often is completely filled between the hours of 9:30 am and 4pm. 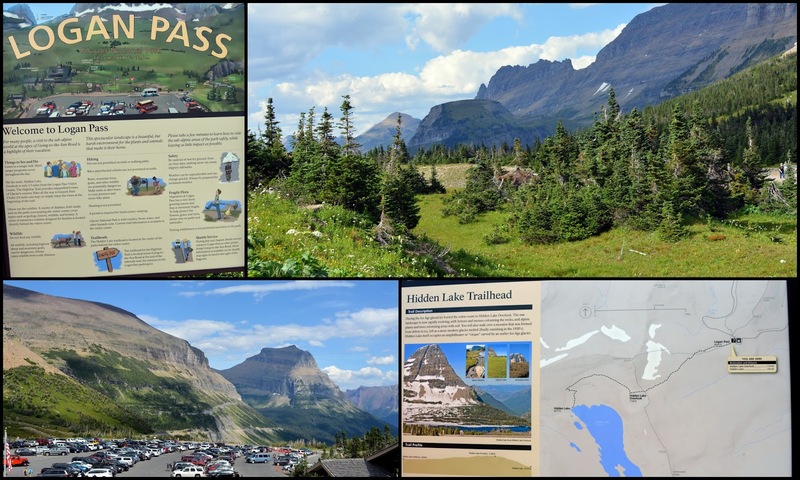 We did manage to park at Logan's pass on one trip on the road and we took the beautiful Hanging Garden Trail to Hidden Lake--click here to see that blog post. This part of the Going-to-the-Sun road is also one of the most difficult to plow in spring. Often over 80 feet (24 m) of snow can lie on top of Logan Pass, and more just east of the pass where the deepest snowfield is referred to as the Big Drift. When we saw this waterfall right on the side of the road we stopped to take photos. It was running quite strongly, and we had fun touching its spray and taking a video of it. If you'd like to see a short video of the waterfall you can click on this facebook link or this Instagram link. I'd also be very pleased if you follow me at either, or both, links! We soon approached the Mt. Jackson viewing area where Jackson Glacier, the seventh largest glacier in Glacier National Park is located. If you click on the photo collage above you can read the park placard that tells how the glaciers are all shrinking over the decades, and sadly it is believed by the year 2030 none of them will remain. As we drove toward St Mary Lake we passed into an area that suffered a serious forest fire in 2015. Over 4,000 acres of forest burned. It was a sad and sobering sight to see, but fires are natures way of renewing the forests and someday there will be new trees growing here again. St. Mary Lake is the second largest lake in Glacier National Park and lies on the eastern end of the park. It is 9.9 miles long and 300 feet deep. In winter is often frozen four feet deep. The little island located towards the middle of the lake is called Wild Goose Island. The St. Mary Valley is so picturesque! I loved the reflections of the mountains on the lake water. 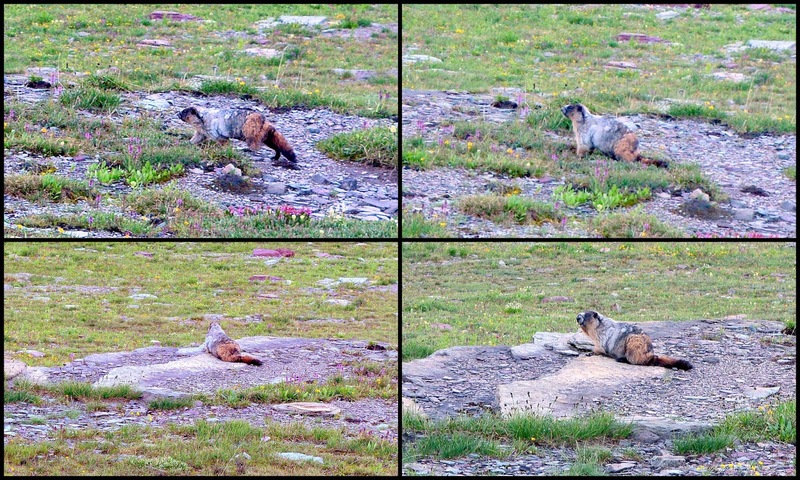 The easternmost part of Glacier National Park is now less dramatic, with rolling hills and plains. We visited the St Mary Visitor Center at the end of the Going-to-the-Sun road. As this visitor center borders the Blackfeet Nation reservation it has interesting Native American information about the meaning of the natural aspects of the park to the native peoples. Every year there is a special program called Native American Speaks where tribal members share their knowledge of the history and culture of native America with Glacier National Park visitors. A view of the eastern entrance to Glacier National Park from a distance. We would make the drive from the western part of Glacier to the east again the next day as we were headed to the Canadian portion of the park called the Waterton-Glacier International Peace Park. See more in my next post! 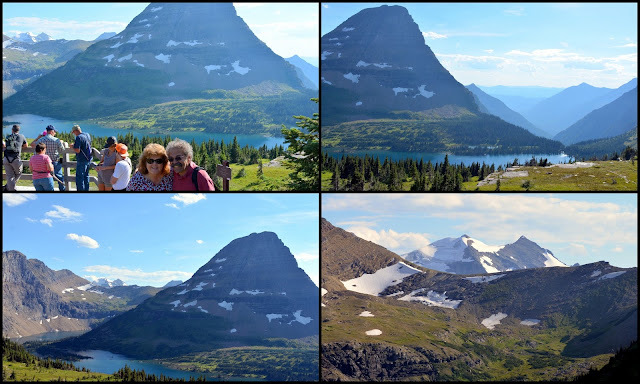 When my husband and I visited Glacier National Park this past August, we were astounded by its natural beauty! 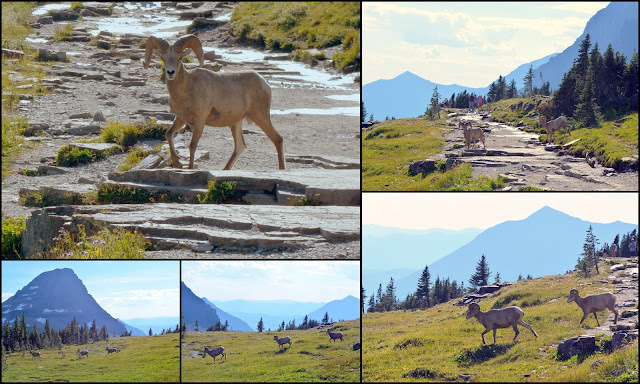 We spent many hours driving along its Going-to-the-Sun road to admire all its scenery, but we also wanted to do a hike during our visit, as the park contains over 700 miles of hiking trails. Happily, we were able to find a parking spot at Logan Pass one afternoon, where we were to embark on the Hanging Garden Trail to Hidden Lake. Logan Pass is on the Continental Divide in Glacier National Park and at 6,646 feet elevation is the highest point on the Going-to-the-Sun road. We had tried two other times to park in the Logan Pass parking lot during our park visit without success. The American National Parks were very popular destinations this summer, and many parks broke attendance records, including Glacier National Park. If you click on to enlarge the photo collage above you can see the trail map of the hike we were going to take. It was 1.5 miles long with an elevation gain of 460 feet. The official name of the trail is Hidden Lake Hanging Garden Trail, and you will soon see why! The beginning of the trail consists of boardwalks that rise along in height with steps as needed. Hikers are asked to stay on the boardwalks to preserve the alpine meadows. As you can see there is an abundance of wildflowers in this area, so many concentrated in these alpine meadows that they have been aptly nicknamed the "hanging gardens." 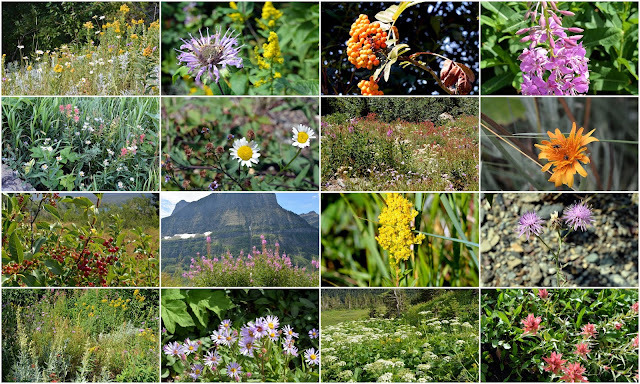 Between the surrounding mountain views and the profuse array of wild flowers along the trail I found myself stopping often, while hiking, to take photos. 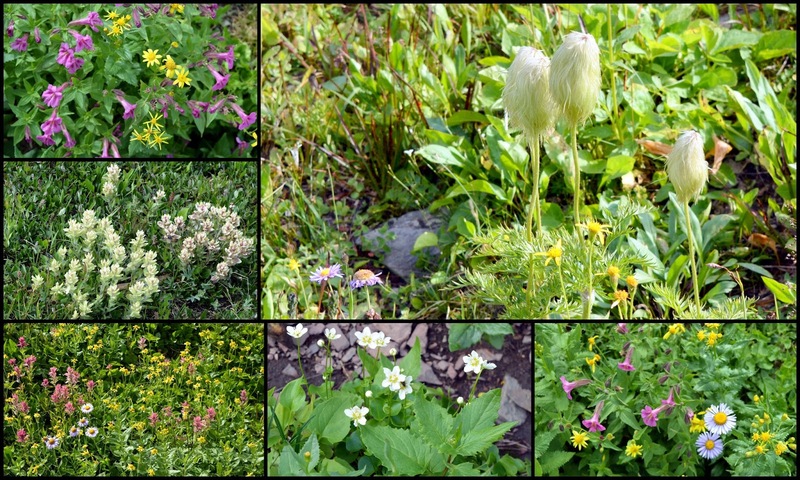 I believe the fluffy white flower in the upper right of this photo collage may be Bear Grass. Bear Grass is a native plant to Glacier National Park and is found only in Northwestern North America. It does not grow every year in the park, and sometimes there can be several years between cycles before it is seen again. ...and back, so as not to miss an amazing view! Beauty was everywhere we looked. ...and eventually the trail turned form boardwalk to natural terrain. We could hear and see the gushing water of melting glaciers all around us! The water was icy cold. If you'd like to see a short video of this melting glacier you can see it on my Mille Fiori Favoriti facebook page on this link, or on my Mille Fiori Favoriti Instagram on this link. 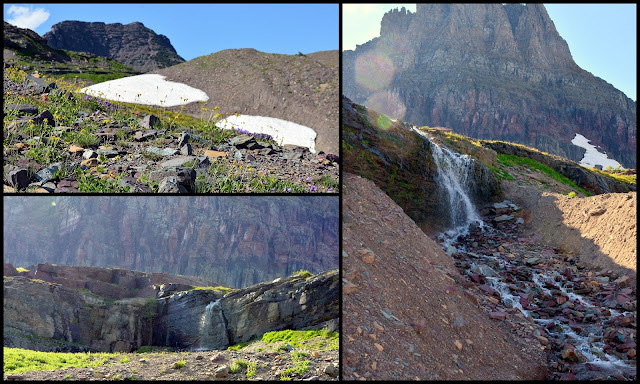 Click to enlarge the photo above to see the waterfalls and streams of the melting glaciers. Looking back, we could no longer see Logan Pass in the distance. There were more gorgeous views ahead. We spied a white mountain goat in the distance. 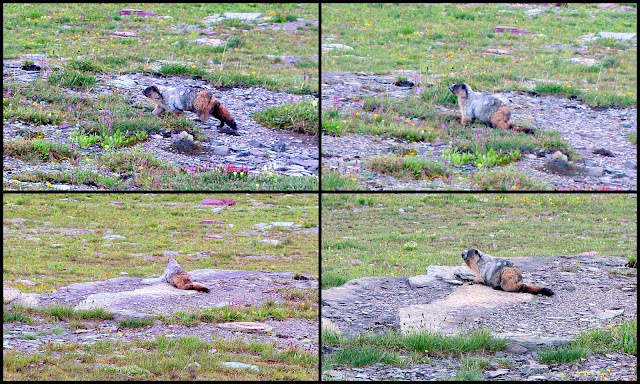 We then spotted quite a few more along the trail, one of which climbed onto some glacier ice to cool off. The mountain goat is the animal symbol of Glacier National Park. Climbing higher with more spectacular mountain glacier views! We now encountered some bighorn sheep. A trio ran right in front of us on the trail and then ran off into the woods. Finally, we saw the Hidden Lake ahead! We stood on the overlook platform, with many other hikers who made the journey, one of whom kindly offered to take our photo. It felt wonderful to have been able to see this magnificent panoramic view of the lake. The trail continued further towards the lake, with a descent of 800 feet, but since it was late afternoon we did not go further. 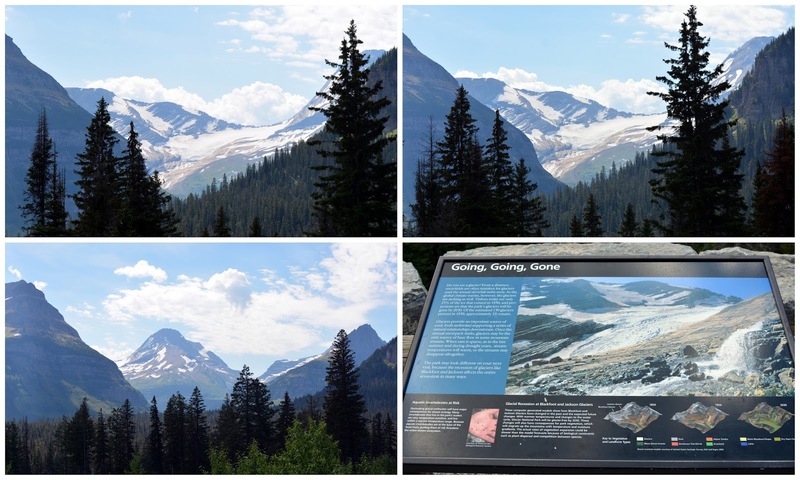 A placard at the overlook tells the sad story of how the Earth's warming trend is not only melting the glaciers at an alarming rate but also allowing the forest to grow higher, which will in turn effect the alpine balance of the environment. After we turned around, and began to descend the trail, we could soon see the Logan Pass parking lot again far in the distance. ...as well as many smaller rodent type animals scurrying around. We passed by the Logan Pass Visitors Center, but because of the late hour of the day we did not go inside. Hanging Garden Trail to Hidden Lake was one of the highlights of our visit to Glacier National park and I'd highly encourage all visitors to walk this trail and enjoy all the fabulous views and flowers along the way! We returned on the Going-to-the-Sun road to continue seeing the sights in Glacier National Park--more of the spectacular beauty of this park to come in the next post. 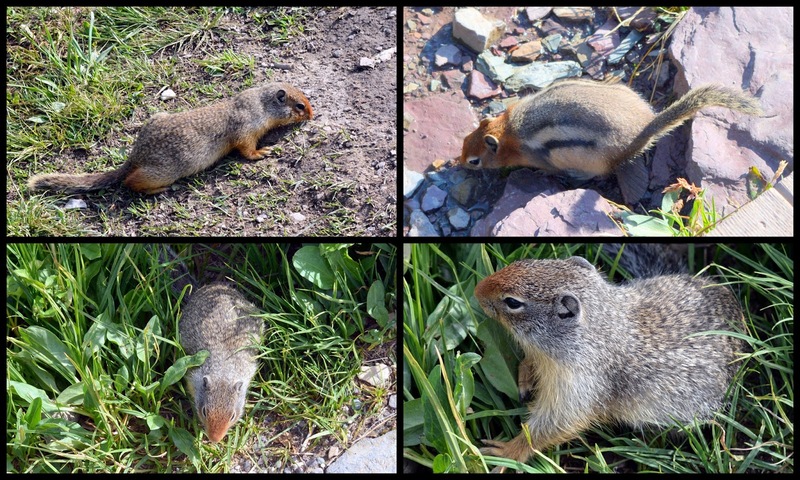 Glacier National Park, Part Two, Trail of the Cedars, can be found on this link.